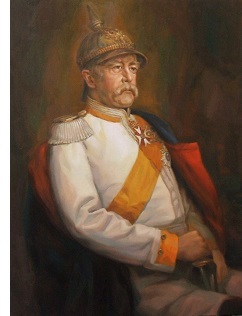 Otto von Bismarck (1815-1898) - Otto von Bismarck was the driving force behind German unification and, as such, could be considered the father of the modern German state. Because of his domineering personality he is more commonly known by his nickname, the "Iron Chancellor." Born the same year Napoleon Bonaparte was defeated at Waterloo, he held a lifelong disdain for France because of the way the emperor ravaged Prussia, In 1862 King Wilhelm I of Prussia (who became king the previous year) appointed him Minister President (roughly equivalent to Prime Minister). He held the office until 1890 (except for a 10 month period in 1873), the longest of anyone in Prussian history. Bismarck was a German nationalist whose dream was to unify all the independent states into a single nation. It had been the dream of many Germans for centuries going all the way back to Otto the Great. One of several problems was the fact that each of the independent states was ruled by its own monarch, and each ruler was reluctant to cede power. For the next decade Bismarck worked to achieve his goal, using two primary tools; persuasion at home and conflict abroad. And he didn't waste any time either. In September 1862, the same month he became Minister President, he delivered his famous "Blood and Iron" speech before the Prussian Chamber of Deputies. The name refers to the path the German states would have to follow in order to unify - "not by speeches and majority decisions...but by iron and blood". It was the speech that earned him the nickname "Iron Chancellor". Abroad, Prussia would fight three wars which would bring the Germans together; the Danish-Prussian, the Austro-Prussian and most famous, the Franco-Prussian Wars (see above). With the conclusion of the Franco-Prussian War, Bismarck had achieved his goal of creating a single German nation. Despite his use of war, Bismarck was a shrewd diplomat as well and immediately set about easing tensions as soon as Germany was created. He was largely successful at restoring balance and Europe remained relatively peaceful for the next forty years until World War I. Bismarck's actions left him with a mixed legacy. In Germany, he is a national hero. Outside Germany, he enjoys far less popularity.